Dan Gargan is on fire out in Los Angeles. The Chestnut Hill Academy and Georgetown graduate has been playing some of the best soccer of his career, starting five games at outside back for the Galaxy and providing three assists. His most recent assist came last weekend late in the game against Portland to help secure a 1-1 draw. His efforts have been consistent throughout the season thus far, and his performance from the weekend landed him a spot on MLS’s Team of the Week. Gargan has been in the league since 2005, and it is great to see him turning things on late in his career. After starting off in Colorado, his career was put on halt when he suffering an ACL injury. Chivas would ultimately sign him, but he retired before even playing in a game in 2008. However, this would not be the end of Gargan, as he returned to soccer in 2009 playing for the USL’s Puerto Rico Islanders. In 2011 he signed with Toronto FC, before moving to Chicago and San Jose. 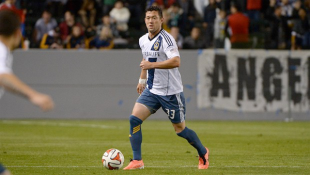 The Galaxy acquired the defender last March, and have been benefiting greatly from his success. LA currently sits 7th in the West, but have only played 7 games compared to others who have 10 or 11 games in the books. Gargan’s story cements the argument that a seasoned veteran is crucial to every team, and we at PSP wish him continued success luck (except for when the Union play the Galaxy in Los Angeles on May 25. Some other notable performances were assists by Greg Cochrane and Jeff Larentowicz in Chicago’s win in the crazy 5-4 road win against New York, and Tony Donatelli’s first goal of the season in Ottawa’s 1-1 draw with Tampa. Russell Canouse, M, Hoffenheim — Played 90 minutes in Sunday’s win over Bayern Munich. League: 22 games. Bobby Warshaw, M, GAIS — Played 90 minutes in midweek loss to Varbergs BoIS. League: 4 games. Love these images and the meoeirms of dealing with my teenage sons as well. It’s the hardest time to stick to your guns, but SO important in spite of the look and the sulk and the frustration. I look forward to seeing the results of many more excursions!